Devote yourself, mind and body, in this 4-hour walking tour in Athens and please both your palate and wanderlust with an unforgettable visit to the majestic Acropolis and Athens Central Market. Try delicacies from all over Greece under the shadow of the sanctuary of Athena. Let us introduce you to Athens through the beauty of the ancient Acropolis and the mouth-watering delights of Athenian cuisine. In the company of our expert guide, embark on a unique private tour which blends mythology and gastronomy in a way that will leave you utterly enchanted with our mythic city! Marialena was a phenomenal tour guide and knew just where to position us for the perfect picture or to keep us in the shade. The food and drinks part is simply to die for and can be reviewed in an entire article on its own as we sampled many different sweet and savoury dishes and local drinks. Highly recommended and such a refreshing experience from start to finish. We were in the port of Piraeus on a cruise and greeking me arranged our pick up. We were so blessed to have a guide who majored in archeology and was very knowledgeable. The food tour was interesting as well. I especially loved the market and seeing all the fish/meat for sale. They then had a driver ready to take us back to the ship. The communication by email was great and the whole tour ran seamlessly and on time. We travelled to Athens for a family Spring Break trip and couldn't be happier with our experience booking this tour. Our group of 5 included our two children (ages 3 and 5) and the guide did a great job keeping them interested and engaged throughout. The food tour stops were excellent, the history and mythology lessons were interesting and our guide was very knowledgeable and friendly. It was great and we highly recommend it. Our tour guide was Vera. She is so knowledgeable and really patience with our boys, 8 and 9. We started off with the Acropolis tour which she really made it so interesting for them, especially all the stories of the Gods. I highly recommend booking the private if you have younger children like us. Then, we started our food tour which again Vera made extremely interesting and we loved the selection of foods from the traditional breads, the meat and fish markets, our lunch finished with delicious pastries. Our guide, Eva, was the perfect person to show my family around Athens. She was smart, kind, and extremely knowledgable about the history and mythology. Combining the acropolis and a small food tour is a great way to squeeze in what Athens is really known for in one day. Thanks for giving my family a great day they will never forget! Beginning on the slopes of the Acropolis, enter the sacred hill through the Propylaea, an imposing marble-gate surrounding the hill. Marvel at the magnificence & the inspired construction of the Parthenon and learn about the eras of worship and destruction it has faced in stony resilience. Set your eyes upon the ethereal Erechtheion and it’s iconic Caryatids, the fair maidens that support the beautiful structure. With υour deeply knowledgeable and passionate guide, learn about the history, legends and myths that envelop this ancient site and enjoy breath-taking views across Athens and out to the Aegean. Join us on this journey through time that will show you the very origins of democracy and political philosophy as we know it today. Next, it’s time to turn your journey through antiquity into one of gastronomy! Discover the very best of Athens’ foodie scene by tasting delights such as home-made dishes, 'koulouri', 'loukoumades' and many more local favorites. Get to know the locals at the vibrant Athens Central Market and see the huge variety of fresh meat, fish, vegetables, and fruits on display. Discover specialist stalls, bursting with colorful and aromatic herbs, spices and condiments; meet with true artisans, who will show you how much time, dedication and love goes into producing their treasured delicacies. Let your taste buds sore as you sample cheeses from across Greece, irresistible cold cuts and perfectly prepared Greek coffee. In Greece, we know how to feed people - fresh, delicious food and plenty of it (no morsel bites here), so be sure to come hungry! We CAN provide food substitutions for vegetarians and we can customize the tour to include gluten free options. Please send us an inquiry. Prepare yourself for an exciting walk & don’t forget your hat, sunglasses, sun-block and a bottle of water. Βring along your camera so you can capture the most beautiful spots of the city. Needless to say that wearing comfortable shoes is an absolute must! Of course, a pick-up from your hotel can be arranged if located downtown. Please send us an inquiry. Not at all! The tour is private and totally customised to your needs. You will be assigned an excellent, flexible guide and the walk will take place at a moderate pace so it will be a pleasant experience for everyone. We will also make several stops to admire and discuss the fascinating monuments and sites along our way. We are going to be in Athens just for a day according to the schedule of our cruise. Is it possible to have this tour while we're there? Of course, it is! This tour is available daily as private. Please send us an email informing us about any relevant details of your cruise (estimated time of arrival, schedule, etc.) 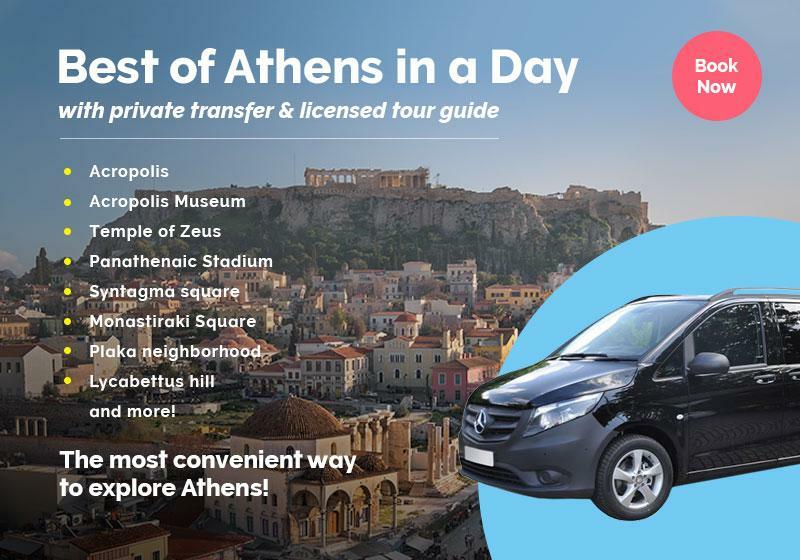 and we will arrange everything on your behalf to experience your one day in Athens to its fullest! The "Acropolis Delights: Acropolis & Athens food tour" is available as a private tour, in order to further customize your experience to fulfill your specific needs & expectations. Simply tell us your preferences in the booking form below.